There are those that come into our lives and offer to it a sweeping change. They often appear first in our youth, and as we grow, we follow their careers. Idolization morphs into understanding, and our heroes become human as we learn of their illnesses, battles and as we come to form strong opinions that differentiate from theirs. But that connection that is born in our early days, that of admiration, never fades. Roger Ebert, film critic for the Chicago Sun-Times (if a career as expansive as his can be reduced to a handful of words), passed away today, after a long fight with cancer. He began writing for that newspaper April 3, 1967. He never quit that job. On April 2nd, he took a “leave of presence”, a beautiful phrase that now stings for anyone raised on his writing. I cannot recall the first review of Ebert’s that I read as a child. It was most likely “heard”, actually, on his television show At the Movies. That show was regular viewing for myself, as it introduced me to films I had never heard of, and taught me to think critically of major releases that I formerly thought to be great, blindly. I was fortunate enough to attend a number of screenings that Ebert viewed in the past year or so. Though I never formally met him, I did ride an elevator with him, and now I will regret always never telling him what he meant to me. Because without Roger Ebert, I have a difficult time knowing that I would be the man I am today. I am pursuing a career in criticism: television, but also other mediums, including film. 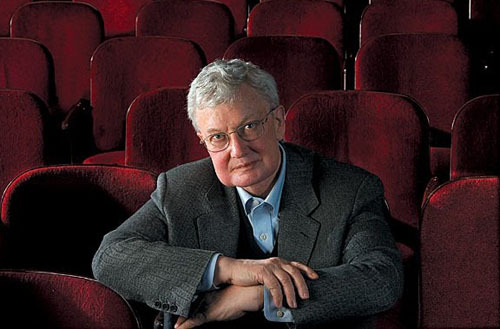 Ebert introduced me, and countless others, to the idea that critics were artists, and that they could create pieces that were important, or beautiful, or simply uproarious (see Ebert’s now-classic review of Mad Dog Time: "[It] is the first I have seen that does not improve on the sight of a blank screen viewed for the same length of time”). I recall, more than any specific review or article, a special I saw. Perhaps it was on the news, or maybe a segment attached to At the Movies; I cannot recall. In this interview, Ebert provided a tour of his house. A room filled with movies, another room a small theater. As he spoke, both in that interview, in reviews, on his blog and etc., he showed a love of movies I have not seen before or since. Ebert taught me more than simply the importance of criticism; he showed me the ability to obsess, and the beauty of loving an art form. Today, and in the days to come, critics will share their favorite Ebert reviews, memories and the like. I recommend reading everything put forward, as it will give you a view of a man both important in his field, and in other ways. Ebert was important for his mind, but also for his strength, fighting a disease while continuing to do the thing he loved. He was important for his passion. And he was, of course, most important to those around him that he loved and that loved him in return. Roger Ebert is one of the most important figures I have ever encountered in my life. He led me to the life I live now. He saved my life, not in the literal sense, but in the fact that he provided me with a passion. As he ended his final blog post, so shall I end this. I’ll see you at the movies Roger Ebert. Every single time I’m in a theater, I will see you.